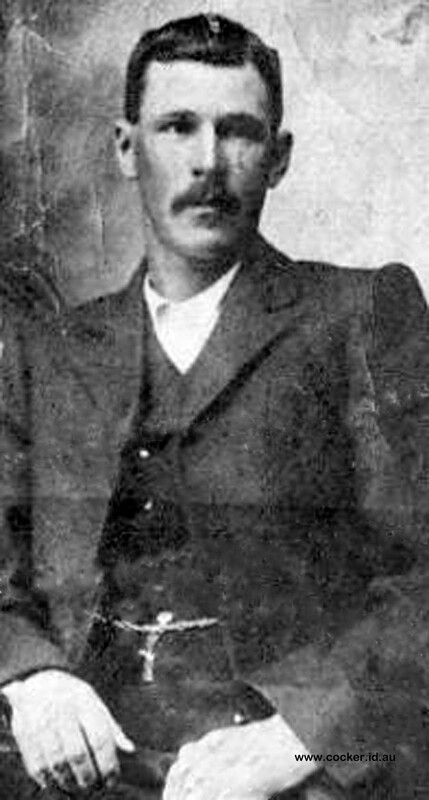 3-Leonard Vincent John Appleby was born on 3 Aug 1884 in Mole Creek and died on 6 Oct 1951 in Ulverstone, Tasmania at age 67. He served in the First World War. Leonard married Daisy Williams, daughter of Philip Edward Williams and Mary Ann Chatwyn, on 2 Jun 1902 in Methodist Church, Abbotsham. Daisy was born on 22 Jul 1883 in Ulverstone, Tasmania and died on 23 Dec 1974 in Ulverstone, Tasmania at age 91. Leonard lived at Mole Creek during his early years and when the family shifted to Ulverstone he, with his sister Florence and brother Bill started school on 5th September, After Leonard finished his schooling he worked and lived at Abbotsham where he met Daisy Williams who was also living at Abbotsham. Leonard and Daisy were both nineteen years of age when the Rev. Wesley John married them in the Methodist Church at Abbotsham on 2nd June, 1902. They lived at Abbotsham for a number of years before shifting to Castra Road, Ulverstone. In 1909 Leonard went cane cutting in Queensland to earn better money, even though it was only seasonal it was profitable. 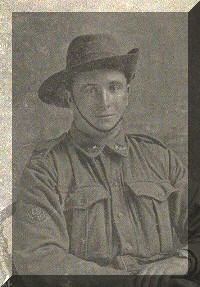 Leonard and Daisy had four children when Leonard enlisted in the Army in 1914. He served three years in the 4th Pioneers Battalion A.I.F. overseas and was repatriated home with war injuries. He was discharged — medically unfit. In 1923 Leonard and Daisy lived and worked a farm at Upper Natone. Leonard loved horses and was a top hand. During his lifetime he broke and trained many of them. Leonard would often return to his old home town of Mole Creek and help sons of his sister Alice, Oxley, Basil and Lewis with the droving of cattle to the cattle run called "The Paddocks". The property was owned by George Lee. It was situated some 48 miles from Mole Creek on the Mersey River. The cattle would be left there to fatten during the summer months. Len with his sister Flo would travel to Mole Creek each year, to visit their sister Alice, in a horse-drawn buggy, travelling some 50-odd miles. Leonard and Daisy had five more children, making nine in all. There were twelve years between the first four children and the next five.Leonard had quite indifferent health and in 1933 shifted back to Ulverstone. During the Second World War, Leonard was a night watchman in the Volunteer Air Observers Corp. The youngest son of the first four children served in the A.I.F. during the Middle East and Tobruk siege, 1939-45 War. TX449. 4-Amy Appleby was born on 8 Jul 1903 in Abbotsham, Tasmania and died on 9 May 1963 at age 59. Amy married Frank Hedley Robertson, son of David Robertson and Harriet Elizabeth Burt. Frank was born on 18 Oct 1894 in Ulverstone, Tasmania and died on 14 Nov 1986 at age 92. They had 14 children: Oscar, Ian David, Ross Frank, Patricia May, Mona Beth, Philip Leonard, Brian Edward, Ella Amy, Peter Geoffrey, Victor George, Joyce Dorothy, Judith Ann, Margaret and John William. 5-Oscar Robertson was born on 7 Oct 1921. He served in the Second World War. Oscar married Sylvia Jean Day. Sylvia was born on 4 Dec 1923. They had two children: Jean and Susan. 6-Jean Robertson was born on 22 May 1943. Jean married Paul Mark Nell. Paul was born on 28 Feb 1935. They had six children: Jacqueline Maree, Andrew Mark, Edward John, Rachel Jean, Kate Michelle and Louise Ann. 7-Jacqueline Maree Nell was born on 14 Jun 1965. 7-Andrew Mark Nell was born on 12 Jun 1967. 7-Edward John Nell was born on 18 May 1970. 7-Rachel Jean Nell was born on 2 Apr 1973. 7-Kate Michelle Nell was born on 14 Dec 1976. 7-Louise Ann Nell was born on 14 Dec 1976. 6-Susan Robertson was born on 7 Jul 1946. Susan married James Robert Wingate. James was born on 17 Apr 1943. They had three children: Joanne Louise, David Robert and Sarah Elizabeth. 7-Joanne Louise Wingate was born on 24 Aug 1969. 7-David Robert Wingate was born on 10 Feb 1971. 7-Sarah Elizabeth Wingate was born on 13 Oct 1973. 5-Ian David Robertson was born on 26 Feb 1923 and died on 22 Sep 1984 at age 61. He served in the Second World War. 5-Ross Frank Robertson was born on 22 Oct 1924. He served in the Second World War. Ross married Mary Buick. Mary was born on 28 Feb 1926. They had seven children: Donald John, Evelyn Margaret, Noel Anthony, Graeme Francis, Michelle Ann, Catherine Ann and Anthony Francis. 6-Donald John Robertson was born on 29 Mar 1946. Donald married Rhonda Tidball. Rhonda was born on 6 May 1950. They had three children: Jayna Teega, Jessica Adelle and Justin. 7-Jayna Teega Robertson was born on 22 Sep 1972. 7-Jessica Adelle Robertson was born on 3 Oct 1974. 7-Justin Robertson was born on 25 Aug 1979. 6-Evelyn Margaret Robertson was born on 12 Sep 1947. Evelyn married Gregory Wood. Gregory was born on 26 Jan 1946. They had three children: Darren, Fiona and Michelle. 7-Darren Wood was born on 20 Oct 1972. 7-Fiona Wood was born on 24 Feb 1973. 7-Michelle Wood was born on 18 Aug 1980. 6-Noel Anthony Robertson was born on 3 Apr 1949. Noel married Anne Fledger. Anne was born on 15 Feb 1950. They had two children: Grant Andrew and Melissa. 7-Grant Andrew Robertson was born on 28 Nov 1970. 7-Melissa Robertson was born on 18 Oct 1972. 6-Graeme Francis Robertson was born on 11 May 1953. Graeme married Patricia Mooney. Patricia was born on 23 Sep 1954. They had three children: Mathew, Timothy and Angela. 7-Mathew Robertson was born on 30 Jul 1975. 7-Timothy Robertson was born on 22 Dec 1981. 7-Angela Robertson was born on 24 Sep 1983. 6-Michelle Ann Robertson was born on 11 May 1959. Michelle married John Williamson. John was born on 23 Aug 1957. They had two children: Kaitlin Louise and Benjamin John. 7-Kaitlin Louise Williamson was born on 24 Aug 1982. 7-Benjamin John Williamson was born on 8 Aug 1985. 6-Catherine Ann Robertson was born on 31 May 1962. Catherine married Jim Healey. Jim was born on 12 Dec 1959. They had three children: Scott, Sarah Louise and Emma Louise. 7-Scott Healey was born on 21 Jul 1980. 7-Sarah Louise Healey was born on 22 Apr 1982. 7-Emma Louise Healey was born on 14 Feb 1986. 6-Anthony Francis Robertson was born on 7 Aug 1964. 5-Patricia May Robertson was born on 22 Oct 1926. Patricia married Bill Hayes. Bill was born on 7 Feb 1926. They had four children: Janice Elaine, Margaret Elizabeth, Sandra Annette and Susan Rae. 6-Janice Elaine Hayes was born on 17 Feb 1947. Janice married Malcolm Murray. Malcolm was born on 9 Sep 1936. They had four children: Julie Marie, Kathy Patricia, Jennifer Jean and John William. 7-Julie Marie Murray was born on 24 Jul 1966. 7-Kathy Patricia Murray was born on 5 Feb 1968. 7-Jennifer Jean Murray was born on 24 Apr 1969. 7-John William Murray was born on 14 Sep 1972. 6-Margaret Elizabeth Hayes was born on 31 Jul 1948. Margaret married Robert John Shaw. Robert was born on 23 Nov 1952. They had three children: Stephen John, Jeffrey Robert and Peter William. 7-Stephen John Shaw was born on 7 Sep 1968. 7-Jeffrey Robert Shaw was born on 12 May 1980. 7-Peter William Shaw was born on 24 Oct 1983. 6-Sandra Annette Hayes was born on 12 Oct 1951. Sandra married William John Fletcher. William was born on 16 Jan 1947. They had three children: Christine Anne, Janine Patricia and Rhianon. 7-Christine Anne Fletcher was born on 5 Jan 1975. 7-Janine Patricia Fletcher was born on 17 Apr 1978. 7-Rhianon Fletcher was born on 28 Feb 1983. 6-Susan Rae Hayes was born on 27 Sep 1954. Susan married Kenneth Ivan Clarkson. Kenneth was born on 12 Apr 1954. They had three children: Leesa Debra, Misty Jade and Melanie Brooke. 7-Leesa Debra Clarkson was born on 26 May 1978. 7-Misty Jade Clarkson was born on 1 Nov 1980. 7-Melanie Brooke Clarkson was born on 15 Jan 1982. 5-Mona Beth Robertson was born on 11 Nov 1927. Mona married John Klae Walsh. John was born on 5 Jun 1923. They had three children: Helen, Jeanette and Robert John. 6-Helen Walsh was born on 20 Jul 1949. Helen married Joseph Guiseppi Lococo. Joseph was born on 14 Jan 1945. They had four children: Teresa Marie, Nicholas John, Christopher Robert and Melissa Beth. 7-Teresa Marie Lococo was born on 10 Jan 1968. 7-Nicholas John Lococo was born on 8 Jun 1969. 7-Christopher Robert Lococo was born on 11 Nov 1970. 7-Melissa Beth Lococo was born on 1 Dec 1972. 6-Jeanette Walsh was born on 20 Apr 1951. Jeanette married Garry Wayne Davenport. Garry was born on 23 Feb 1956. They had one daughter: Amanda Beth. 7-Amanda Beth Davenport was born on 21 Feb 1984. 6-Robert John Walsh was born on 20 Jan 1953 and died on 29 Mar 1983 at age 30. 5-Philip Leonard Robertson was born on 26 Feb 1930 and died on 26 Feb 1980 at age 50. Philip married Margaret Scott-Brown. Margaret was born on 9 Jun 1936. They had two children: Jenny Faith and James Hedley. 6-Jenny Faith Robertson-Woods was born on 16 Dec 1958. Jenny married Michael Dascali. Michael was born on 23 Apr 1959. 6-James Hedley Robertson-Woods was born on 11 May 1960. James married Annette Beverley McGowan. Annette was born about 1962. They had two children: Ricky James and Bradley Patrick. 7-Ricky James Robertson-Woods was born on 22 Nov 1983. 7-Bradley Patrick Robertson-Woods was born on 5 Aug 1985. 5-Brian Edward Robertson was born on 29 Apr 1931. Brian married Merle Coralie Gardiner. Merle was born on 18 Mar 1927. They had three children: Garry, Gail and Lee. 6-Garry Robertson was born on 2 Mar 1953. Garry married Gaynor Brown. Gaynor was born on 26 Sep 1956. They had two children: Emma Louise and Timothy James. 7-Emma Louise Robertson was born on 9 Sep 1980. 7-Timothy James Robertson was born on 27 Nov 1983. 6-Gail Robertson was born on 17 Oct 1954. Gail married Garry Twyford. Garry was born on 21 Nov 1951. They had two children: Chanel Lee and Kate Jane. 7-Chanel Lee Twyford was born on 30 Jul 1984. 7-Kate Jane Twyford was born on 18 Jun 1986. 6-Lee Robertson was born on 22 Jun 1957. 5-Ella Amy Robertson was born on 22 Jan 1934. Ella married Dennis Reid. Dennis was born on 1 Jun 1933. They had four children: Amanda, Anthony, Gregory and Stewart. 6-Amanda Reid was born on 14 Jul 1959. 6-Anthony Reid was born on 20 Mar 1962. 6-Gregory Reid was born on 22 Feb 1964. 6-Stewart Reid was born on 22 Jan 1968. 5-Peter Geoffrey Robertson was born on 21 Mar 1935. Peter married Christine Fleming. Christine was born on 8 Jun 1934. They had three children: Wendy Lee, Julie Anne and Neil Peter. 6-Wendy Lee Robertson was born on 24 May 1960. 6-Julie Anne Robertson was born on 29 Aug 1961. 6-Neil Peter Robertson was born on 3 Dec 1962. 5-Victor George Robertson was born on 24 Feb 1937. Victor married Margaret Porter. Margaret was born on 8 Dec 1938. They had eight children: Elizabeth Pauline, Cheryle Anne, Wayne Victor, Jeffrey William, Deborah Margaret, David Raynor, Gabrielle Amy and Angela Barbara. 6-Elizabeth Pauline Robertson was born on 13 May 1957. Elizabeth married Darryl Peter Andrews. Darryl was born on 14 Jun 1956. 6-Cheryle Anne Robertson was born on 11 Apr 1958. Cheryle married Wayne John Hall. Wayne was born on 4 Dec 1955. They had three children: Benjamin Shane, Luke Adams and Emily Jane. 7-Benjamin Shane Hall was born on 2 May 1978. 7-Luke Adams Hall was born on 21 Oct 1981. 7-Emily Jane Hall was born on 1 Feb 1985. 6-Wayne Victor Robertson was born on 6 Jul 1959. 6-Jeffrey William Robertson was born on 19 Sep 1960. 6-Deborah Margaret Robertson was born on 14 Jul 1962. 6-David Raynor Robertson was born on 28 Jul 1964. 6-Gabrielle Amy Robertson was born on 28 Nov 1968. 6-Angela Barbara Robertson was born on 4 Jun 1970. 5-Joyce Dorothy Robertson was born on 30 Sep 1938. Joyce married Norman McLeod. Norman was born on 28 Nov 1937. They had four children: Lea Joy, Russell, Andrew Stewart and Douglas James. 6-Lea Joy McLeod was born on 6 Mar 1961. Lea married Paul Joliffe. Paul was born on 24 Oct 1959. They had four children: Brainnan, Jesse Paul, Jacinta Ebony and Marinda Lee. 7-Brainnan Joliffe was born on 14 Jul 1982. 7-Jesse Paul Joliffe was born on 5 Jan 1984. 7-Jacinta Ebony Joliffe was born on 15 Apr 1985. 7-Marinda Lee Joliffe was born on 10 Sep 1986. 6-Russell McLeod was born on 11 Feb 1962. Russell married Janine Price. Janine was born on 17 Sep 1963. 6-Andrew Stewart McLeod was born on 16 Dec 1966. 6-Douglas James McLeod was born on 21 Jan 1971. 5-Judith Ann Robertson was born on 29 May 1940. Judith married Raymond Goudey. Raymond was born on 7 Jan 1942. They had four children: Karen Amy, Peter James, Heather Marie and Benjamin Frank. 6-Karen Amy Goudey was born on 20 May 1967. 6-Peter James Goudey was born on 21 May 1969 and died. 6-Heather Marie Goudey was born on 13 Aug 1972. 6-Benjamin Frank Goudey was born on 27 Apr 1974 and died. 5-Margaret Robertson was born on 10 Oct 1942. Margaret married Roy Weatherall. Roy was born on 18 May 1941. They had three children: Tamara Amy, John Robert and Scott Ray. 6-Tamara Amy Weatherall was born on 24 Feb 1967. 6-John Robert Weatherall was born on 4 Sep 1968. 6-Scott Ray Weatherall was born on 20 Jul 1970. 5-John William Robertson was born on 26 Sep 1947. John married Lynette Jean Wright. Lynette was born on 7 Jul 1948. They had one daughter: Narelle. 6-Narelle Robertson was born on 28 Aug 1973. John next married Juliet Kromdoff. Juliet was born on 2 Feb 1955. They had one daughter: Tenice Lee. 6-Tenice Lee Robertson was born on 24 Mar 1981. 4-Pansy Grace Appleby was born on 24 Nov 1904 and died on 17 Jun 1936 at age 31. Pansy married Bertie William Belbin, son of Arthur Belbin and Annie Maria Pedder. Bertie was born on 14 May 1896 in Evandale, Tasmania and died on 18 Aug 1972 at age 76. 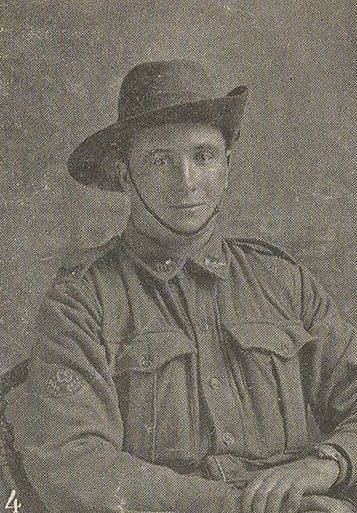 He served in the First World War in the 12th and later 52nd Battalion. They had seven children: Ronald William, Desmond Phillip, Bruce, Don Arthur, Kathleen Audrey, Stafford James and Barry Glen. 5-Ronald William Belbin was born on 3 Mar 1924. He served in the Second World War. Ronald married Gloria Hawkins. Gloria was born about 1925. They had three children: Rosemary, Geoffrey and Andrew. 6-Rosemary Belbin was born about 1947. 6-Geoffrey Belbin was born about 1949. 6-Andrew Belbin was born about 1951. 5-Desmond Phillip Belbin was born on 10 Aug 1925. He served in World War. Desmond married Kath Masters, daughter of Ernest Masters and Alma Etheleen Barker. Kath was born on 11 Jun 1932. Desmond next married Sylvia Jean Padman. Sylvia was born on 21 Jan 1927. They had four children: Rodney Philip, Leigh Desmond, Anthony John and Shane Michael. 6-Rodney Philip Belbin was born on 11 Dec 1947. Rodney married Penelope Susan Dye. Penelope was born on 4 Mar 1948. They had two children: Kerin Louise and Dianne Adel. 7-Kerin Louise Belbin was born on 23 Aug 1976. 7-Dianne Adel Belbin was born on 8 Aug 1978. 6-Leigh Desmond Belbin was born on 11 Feb 1951. Leigh married Dianne Florence Wellard. Dianne was born on 2 Jan 1954. They had two children: Jodie Leigh and Jamie Michael. 7-Jodie Leigh Belbin was born on 18 Jan 1975. 7-Jamie Michael Belbin was born on 17 May 1976. 6-Anthony John Belbin was born on 21 Jun 1952. 6-Shane Michael Belbin was born on 21 Sep 1955. Shane married Estelle Maria Klein. Estelle was born on 23 Aug 1953. They had one son: Shaun Michael. 7-Shaun Michael Belbin was born on 21 Sep 1979. Desmond next married Kath Johns. Kath was born on 11 Jun 1932. 5-Bruce Belbin was born on 15 Jan 1928 and died on 14 Feb 1996 at age 68. Bruce married Rita Veronica Wiseman. Rita was born on 28 Dec 1929. They had nine children: Patricia Grace, Gail Annette, Anne Maree, Michael Wayne, Wendy Joy, Joanne, Debbie Lee, Peter John and Colin Bruce. 6-Patricia Grace Belbin was born on 2 Feb 1948. Patricia married John Anthony Haines, son of Ross John Haines and Judith Wilma King. John was born on 31 Jan 1948. They had six children: Veronica Lee, Anthony Bruce, Melissa Jane, Michelle Louise, Katrina Maree and Mathew Anthony. 7-Veronica Lee Haines was born about 1965. Veronica married someone. He had one son: Nathan Robert. 8-Nathan Robert Haines was born on 19 May 1984. 7-Anthony Bruce Haines was born on 26 Feb 1967. 7-Melissa Jane Haines was born on 19 Oct 1971. 7-Michelle Louise Haines was born on 12 May 1973. 7-Katrina Maree Haines was born on 14 Dec 1975. 7-Mathew Anthony Haines was born on 28 Sep 1977. 6-Gail Annette Belbin was born on 23 Aug 1949. Gail married David Streets. David was born on 30 Aug 1947. They had three children: Garry Steven, Cynthia Lorraine and Tony Allan. 7-Garry Steven Streets was born on 26 Oct 1966. 7-Cynthia Lorraine Streets was born on 22 May 1968. 7-Tony Allan Streets was born on 22 May 1970. 6-Anne Maree Belbin was born on 4 Jan 1952. Anne married Terry John Walsh. Terry was born on 7 Jun 1950. They had two children: Samantha Anne and Lisa Maree. 7-Samantha Anne Walsh was born on 26 Nov 1971. 7-Lisa Maree Walsh was born on 7 Nov 1976. 6-Michael Wayne Belbin was born on 2 May 1953. Michael married Sue Griggan. Sue was born on 1 Oct 1959. They had two children: Nicolle and Anthony. 7-Nicolle Belbin was born on 16 Jun 1977. 7-Anthony Belbin was born on 11 Nov 1979. 6-Wendy Joy Belbin was born on 23 Nov 1954. Wendy married someone. She had four children: Mark Anthony, Christine Mary, Damien John and Natasha Jane. 7-Mark Anthony Belbin was born on 11 May 1974. 7-Christine Mary Belbin was born on 29 May 1977. 7-Damien John Belbin was born on 23 Nov 1979. 7-Natasha Jane Belbin was born on 13 Feb 1984. 6-Joanne Belbin was born on 25 Feb 1956. Joanne married Michael Moffat. Michael was born on 28 Jun 1956. They had four children: Sandra, Amanda, Theresa and Debbie. 7-Sandra Moffat was born on 10 Dec 1975. 7-Amanda Moffat was born on 30 May 1977. 7-Theresa Moffat was born on 17 May 1980. 7-Debbie Moffat was born on 13 Aug 1983. 6-Debbie Lee Belbin was born on 29 Nov 1959. Debbie married Desmond James O'Connor. Desmond was born on 1 Jan 1957 and died on 13 Nov 1982 at age 25. They had two children: Donna Lee and Darrin James. 7-Donna Lee O'Connor was born on 24 Aug 1975. 7-Darrin James O'Connor was born on 3 Nov 1977. 6-Peter John Belbin was born on 29 Nov 1959. 6-Colin Bruce Belbin was born on 18 Nov 1960. 5-Don Arthur Belbin was born on 5 Jun 1929. Don married Margaret Woomer. Margaret was born on 14 Dec 1939 and died. They had two children: Bradley and Debbie Maree. 6-Bradley Belbin was born on 19 Jun 1962. 6-Debbie Maree Belbin was born on 22 Oct 1963. Debbie married Darrel Andrew Byard, son of Neville Byard and Kaye Elizabeth Woodhouse. Darrel was born on 19 May 1964 in Devonport. They had two children: Leigh Damion and Keegan Andrew. 5-Kathleen Audrey Belbin was born on 26 Jul 1931. Kathleen married Desmond Wing. Desmond was born on 11 May 1926. They had four children: Gregory, Wayne, Andrew and Robert. 6-Gregory Wing was born on 25 Feb 1955. Gregory married Wendy McCarthy. Wendy was born on 3 Feb 1960. They had two children: Belinda Marie and Stephanie Louise. 7-Belinda Marie Wing was born on 20 Feb 1980. 7-Stephanie Louise Wing was born on 13 Feb 1985. 6-Wayne Wing was born on 30 Dec 1957. Wayne married Lisha Broome. Lisha was born on 7 Feb 1964. 6-Andrew Wing was born on 6 Oct 1961. Andrew married Teresa Berne. Teresa was born on 25 Jun 1963. 6-Robert Wing was born on 6 Oct 1961. Robert married Noreen Roles. Noreen was born on 6 Aug 1964. 5-Stafford James Belbin was born on 17 Mar 1934. Stafford married Margaret. Margaret was born about 1935. 5-Barry Glen Belbin was born on 7 Jun 1936. Barry married Barbara Dargan. Barbara was born about 1937. They had four children: Debbie Marie, Peter John, Denise and Robert Craig. 6-Debbie Marie Belbin was born on 24 Oct 1960. 6-Peter John Belbin was born on 13 Dec 1963 and died in Apr 1964. 6-Denise Belbin was born on 16 Dec 1965. 6-Robert Craig Belbin was born on 23 Apr 1968. 4-Douglas Oliver Appleby was born on 14 Feb 1906 and died on 2 Mar 1986 at age 80. Douglas married Lillian Alice Powe, daughter of Arthur William Powe and Flora Matilda Caroline Nibbs. Lillian was born on 14 Jun 1904 in Latrobe. They had eight children: Doreen, Murray Douglas, Claude Gray, Oliver Neville, Beth Clare, Janet Lillian, Sheila Agnes and Lyndon Howard. 5-Doreen Appleby was born on 22 Sep 1924. She served in the Second World War. Doreen married Derek Sydney William Hilder. Derek was born on 17 May 1927 and died on 5 Jul 1986 at age 59. They had one son: Gregory Arthur. 6-Gregory Arthur Hilder was born on 17 May 1952. Gregory married June Elizabeth Ellison. June was born on 15 Jan 1953. They had one daughter: Emma. 7-Emma Hilder was born on 26 Jan 1985. 5-Murray Douglas Appleby was born on 12 Oct 1927. Murray married Zeena Joyce Lynch. Zeena was born on 17 Feb 1931. They had two children: Barry and Suzanne Joy. 6-Barry Appleby was born on 11 Mar 1951. Barry married Christine Armiger. Christine was born on 22 May 1954. They had one son: Nicholas Kerin Douglas. 7-Nicholas Kerin Douglas Appleby was born on 18 Mar 1986. 6-Suzanne Joy Appleby was born on 4 Jun 1966. Suzanne married someone. She had one daughter: Jade Amanda. 7-Jade Amanda Appleby was born on 12 Jul 1985. 5-Claude Gray Appleby was born on 11 Nov 1928. Claude married Dorothy Sturzaker. Dorothy was born on 1 Mar 1931. They had three children: Elaine Beverley, Helen Maree and Colleen. 6-Elaine Beverley Appleby was born on 7 Oct 1953. 6-Helen Maree Appleby was born on 12 Feb 1958. Helen married someone. She had one daughter: Kim. 7-Kim Appleby was born on 2 Jul 1980. 6-Colleen Appleby was born on 28 Oct 1970. 5-Oliver Neville Appleby was born on 22 Feb 1930. Oliver married Yvonne Marguerite Hilder. Yvonne was born on 9 Dec 1931. They had two children: Lynne and Jean. 6-Lynne Appleby was born on 16 Aug 1956. Lynne married John Sattler. John was born on 30 Oct 1954. They had one son: Jordan John. 7-Jordan John Sattler was born on 7 Jan 1986. 6-Jean Appleby was born on 24 Sep 1959. Jean married Garry Rigney. Garry was born on 1 Aug 1959. 5-Beth Clare Appleby was born on 31 May 1936. Beth married Barry Charles Gardam. Barry was born on 15 Feb 1930. They had two children: Baden Douglas and Tracy Aileen. 6-Baden Douglas Gardam was born on 21 Oct 1959. 6-Tracy Aileen Gardam was born on 2 Oct 1966. Tracy married Michael Barry Freeburn. Michael was born on 27 Apr 1964. 5-Janet Lillian Appleby was born on 16 Jun 1938 and died on 24 Apr 1987 at age 48. Janet married Lloyd John Barker. Lloyd was born on 4 Jul 1936. They had five children: Darrell John, Trevor Maxwell, Bruce Desmond, Leanne Joan and Jason Leigh. 6-Darrell John Barker was born on 28 Oct 1957. Darrell married Jenny Lawes. Jenny was born on 16 Jun 1961. They had two children: Jarrod and Rowen. 7-Jarrod Barker was born on 16 Apr 1982. 7-Rowen Barker was born on 24 Sep 1984. 6-Trevor Maxwell Barker was born on 30 Dec 1959. Trevor married Sharon Bonney. Sharon was born on 7 Jan 1958. They had two children: Nicholas John and Curtis Leigh. 7-Nicholas John Barker was born on 29 May 1986. 7-Curtis Leigh Barker was born on 16 Mar 1988. Another name for Curtis is Curtis Barker. 6-Bruce Desmond Barker was born on 2 Feb 1960. Bruce married Carol Cowmeadow. Carol was born on 10 May 1959. They had two children: Corey Bruce and Dana Janet. 7-Corey Bruce Barker was born on 8 Feb 1985. 7-Dana Janet Barker was born on 15 Aug 1987. 6-Leanne Joan Barker was born on 9 Jan 1964. Leanne married Rodney Dunham. Rodney was born on 19 Oct 1960. Leanne next married Gregory Allan Ansell. Gregory was born on 26 Jul 1963. 6-Jason Leigh Barker was born on 25 Mar 1974. 5-Sheila Agnes Appleby was born on 29 Feb 1940. Sheila married Donald Rex Ray. Donald was born on 31 Jan 1933. They had four children: Rodney Wayne, Leon Trevor, Bevan John and Tony James. 6-Rodney Wayne Ray was born on 16 Sep 1956. Another name for Rodney is Rodney Wayne Ray. Rodney married Amanda Helen Smith, daughter of Percy William Smith and June Amy Stubbs. Amanda was born on 30 Sep 1959. They had two children: Joshua Wayne and Adam John. 6-Leon Trevor Ray was born on 15 Nov 1957. Leon married Jenny Darby. Jenny was born on 17 Jul 1959. They had two children: Ben and Alan. 7-Ben Ray was born on 25 Sep 1981. 7-Alan Ray was born on 19 May 1983. 6-Bevan John Ray was born on 14 Apr 1960. Bevan married Leanne Everett. Leanne was born on 24 Oct 1962. They had one son: Kurt Brydon. 7-Kurt Brydon Ray was born on 28 Apr 1988. 6-Tony James Ray was born on 17 Jun 1964. Tony married Lisa Crawford. Lisa was born on 6 Oct 1965. They had one daughter: Gerlinda Anne. 7-Gerlinda Anne Ray was born on 23 Apr 1987. 5-Lyndon Howard Appleby was born on 20 Sep 1945. Lyndon married Laurene Lesley Smith. Laurene was born on 21 Jul 1951. They had three children: Linda Louise, Dean Alfred and Sharyn Gaye. 6-Linda Louise Appleby was born on 19 Oct 1969. 6-Dean Alfred Appleby was born on 6 Mar 1972. 6-Sharyn Gaye Appleby was born on 8 May 1974. 4-Geoffrey Allison Appleby was born on 4 Mar 1908 and died on 28 Nov 1962 at age 54. He served in the Second World War. 4-Leonard Tasman Appleby was born on 18 Mar 1920 and died on 3 Dec 1975 at age 55. Leonard married Rosie Amelia Wellar. Rosie was born on 5 Jan 1927. They had three children: Anthony, Dianne Gloria and Malcolm Tasman. 5-Anthony Appleby was born on 4 Jul 1947. Anthony married Kathleen Brinkman. Kathleen was born on 22 Feb 1955. They had two children: Dean and Derryn Wayne. 6-Dean Appleby was born on 23 Feb 1980. 6-Derryn Wayne Appleby was born on 12 Apr 1982. 5-Dianne Gloria Appleby was born on 17 Jan 1951. 5-Malcolm Tasman Appleby was born on 2 Jun 1962. 4-Trevor Vincent Appleby was born on 19 Nov 1922. He served in the Second World War. Trevor married Kath Radford. Kath was born on 28 Apr 1922. They had two children: Lorraine and Gaye. 5-Lorraine Appleby was born on 18 Jan 1942. Lorraine married Barry Clarence Radford. Barry was born on 14 Feb 1939 and died on 26 Nov 2004 at age 65. They had three children: Maree, Wayne John and Sharon. 6-Maree Radford was born on 16 May 1958. Maree married Glen Riley. Glen was born on 26 Aug 1953. They had three children: Justin, Glen and Melissa. 7-Justin Riley was born on 9 Feb 1978. 7-Glen Riley was born in Aug 1980. 7-Melissa Riley was born on 2 Dec 1982. 6-Wayne John Radford was born on 10 Jun 1960. Wayne married Judy Baker. Judy was born on 28 Sep 1962. They had two children: Jade and Kytana Patricia. 7-Jade Radford was born on 3 Aug 1983. 7-Kytana Patricia Radford was born on 29 May 1985. 6-Sharon Radford was born on 16 Feb 1966. Sharon married David Fitzpatrick. David was born on 12 May 1964. They had two children: David and Lyndon Craig. 7-David Fitzpatrick was born on 9 Aug 1982. 7-Lyndon Craig Fitzpatrick was born on 9 Dec 1984. 5-Gaye Appleby was born on 5 May 1949. Gaye married Allan Cousens. Allan was born on 12 Jan 1948. They had four children: Karen, Gregory, Rodney and Timothy. 6-Karen Cousens was born on 31 Jul 1966. 6-Gregory Cousens was born on 8 Jul 1968. 6-Rodney Cousens was born on 30 Jun 1972. 6-Timothy Cousens was born on 12 Jan 1978. Trevor next married Phyllis Warren. Phyllis was born on 27 Dec 1933. They had three children: Nerridi Lyn, Gregory Trevor and Sandra Joy. 5-Nerridi Lyn Appleby was born on 6 Jul 1956. Nerridi married Leonard Crawford. Leonard was born on 18 Aug 1955. They had three children: Terrena Anne, Pauline Tanya and Scott Allan. 6-Terrena Anne Crawford was born on 20 Oct 1974. 6-Pauline Tanya Crawford was born on 24 Oct 1976. 6-Scott Allan Crawford was born on 27 May 1980. 5-Gregory Trevor Appleby was born on 22 Feb 1959. Gregory married Heather Maryanne Dighton. Heather was born on 14 Feb 1961. They had two children: Melissa Jane and Kelly Marie. 6-Melissa Jane Appleby was born on 10 Sep 1979. 6-Kelly Marie Appleby was born on 28 Jan 1982. 5-Sandra Joy Appleby was born on 2 Nov 1960. Sandra married David James Stinton. David was born on 2 Feb 1956. They had one son: Matthew David. 6-Matthew David Stinton was born on 21 May 1980. 4-Glen Appleby was born on 20 Feb 1925 and died on 28 Jul 1983 at age 58. Glen married Cecilia Rose Beams. Cecilia was born on 14 Apr 1933. They had five children: Barbara, Darrell, Shirley, Graham and Wendy. 5-Barbara Appleby was born on 22 Aug 1953. Barbara married James Keillor. James was born on 3 Apr 1948. 5-Darrell Appleby was born on 25 Jan 1955 and died on 28 Jul 1983 at age 28. 5-Shirley Appleby was born on 24 Aug 1957. Shirley married Paul Osborne. Paul was born on 9 Nov 1951. They had two children: Jason and Melissa. 6-Jason Osborne was born on 28 Aug 1980. 6-Melissa Osborne was born on 21 Feb 1982. 5-Graham Appleby was born on 16 Jun 1958. Graham married Kathleen Edwards. Kathleen was born on 20 Nov 1954. They had one daughter: Sarah Katherine. 6-Sarah Katherine Appleby was born on 3 Oct 1986. 5-Wendy Appleby was born on 26 Oct 1960. Wendy married Michael Robb. Michael was born on 2 May 1960. They had three children: Jeremy, Benjamin and Nicholas. 6-Jeremy Robb was born on 17 Jan 1979. 6-Benjamin Robb was born on 1 May 1982. 6-Nicholas Robb was born on 24 Jan 1984. 4-Mary Pegg Appleby was born on 23 Oct 1926. Mary married Robert Norman Brown. Robert was born on 19 Nov 1926. They had one son: Anthony Robert. 5-Anthony Robert Brown was born on 20 May 1948. Anthony married Donah Davidson. Donah was born on 4 Jan 1948. They had two children: Neil and Kim. 6-Neil Brown was born on 28 Mar 1969. 6-Kim Brown was born on 22 Apr 1970. Kim married Christopher Yates. Christopher was born about 1970 in Launceston. They had one son: Dale Roland. 7-Dale Roland Yates was born on 12 May 1987. Mary next married Ronald Edgar Bannon. Ronald was born on 10 Mar 1918. They had three children: Starr, Ricky and Geoffrey Ronald. 5-Starr Bannon was born on 14 Jan 1955. Starr married Zane Landt. Zane was born on 16 Aug 1954. They had four children: Mathew Vincent, Tammie, Kasey and Scott William James. 6-Mathew Vincent Landt was born on 2 Sep 1973. 6-Tammie Landt was born on 23 Jul 1975. 6-Kasey Landt was born on 17 May 1977. 6-Scott William James Landt was born on 8 Jan 1983. 5-Ricky Bannon was born on 12 Feb 1958. Ricky married Christine Donohue. Christine was born on 22 Feb 1959. They had three children: Shandell Louise, Lee Ronald and Troy Ricky. 6-Shandell Louise Bannon was born on 6 Dec 1977. 6-Lee Ronald Bannon was born on 22 Feb 1978. 6-Troy Ricky Bannon was born on 16 Sep 1979. Ricky next married Kathy Blackmore. Kathy was born on 2 Dec 1963. They had one son: Jonathan Clint. 6-Jonathan Clint Bannon was born on 21 Dec 1986. 5-Geoffrey Ronald Bannon was born on 23 Jun 1963. 4-Daisy Noel Appleby was born on 15 Aug 1929. Daisy married Max Mervyn Chatwin. Max was born on 3 Jun 1927. They had four children: Vicki Anne, Suzanne Maxine, Geraldine Denise and Richard Oliver. 5-Vicki Anne Chatwin was born on 12 Sep 1953. Vicki married Peter Beattie. Peter was born on 12 Jun 1950. They had three children: Jodie Anne, Kellie Peta and Daniel Alfred Frederick. 6-Jodie Anne Beattie was born on 12 Jun 1973. 6-Kellie Peta Beattie was born on 30 Oct 1974. 6-Daniel Alfred Frederick Beattie was born on 17 Apr 1979. 5-Suzanne Maxine Chatwin was born on 20 Aug 1955. Suzanne married Kerry Wayne Smith. Kerry was born on 24 Feb 1954. They had two children: Nathan Wayne and Damien Aaron. 6-Nathan Wayne Smith was born on 15 Apr 1979. 6-Damien Aaron Smith was born on 8 Sep 1982. 5-Geraldine Denise Chatwin was born on 6 Nov 1956. Geraldine married Henry Edward Riley. Henry was born on 28 May 1954. They had three children: Dwaine Edward, Carol Gaye and Tegan Louise. 6-Dwaine Edward Riley was born on 7 Mar 1976. 6-Carol Gaye Riley was born on 6 Jan 1979. 6-Tegan Louise Riley was born on 23 Jul 1985. 5-Richard Oliver Chatwin was born on 21 Feb 1959.